Grace Mantini left New York after her world was shattered by a ruthless man. And he destroyed the love she had for one man. She ran to Las Vegas and thought she was okay, until her father and brother show up for a funeral. Grace didn't want to believe that her father was part of the mob but when she learned the truth, she ran. Now that they are all in Vegas and at a mob funeral, Grace has to see all these mobsters again. But when she sees Rocco, her heart starts beating again after six years. Rocco was saved from an orphanage, or so he thought, but he was raised to be a mob enforcer. His life was to be a hired killer and feelings were not part of his life. So falling in love with Grace was not supposed to happen. But she was the only light in his dark world. When a contract comes to Rocco that will destroy Grace, he has to find a way to protect her and not complete the contract. He has to protect her family and keep her safe. He has to find out who sent the contract and why? Can he get Nico and the family to help him to protect her and her family? Will they find out who will be sent to fulfill the contract if Rocco doesn't? Can Grace trust Rocco to tell her the truth about the contract and to protect her and her family? I loved this story and it was hard to read about Rocco and his upbringing, but the one thing in his life he lived for was Grace. This series is great and worth the read if you love a great mob story; each story is about a different mobster and each story is just as great. So get this series, sit back, and enjoy the ride that is the Ruin & Revenge series. I hope you love it as much as I have. Mafia books are one of my favorites and this series has been great so far. I really enjoyed the storyline in this one, I love that though the main characters were previously involved and meet back up, they don’t immediately fall back into bed together. Rocco, aka Frankie, was adopted by a man who trained him to be a deadly killer with no emotion, stripping him of everything that meant anything to him at an early age. He meets Grace, a Mafia princess, when she’s just a little girl and the two spend a lot of time together with him acting as her bodyguard. They have a deep connection, and when she becomes of age the two get together, but when Rocco’s father finds out he goes to an extreme to get rid of their relationship and it sent Grace running across the country. Now, years later, the two cross paths again, but this time Grace isn’t running away and will do whatever she can to keep Rocco. There are two reasons I’m giving four stars instead of five. 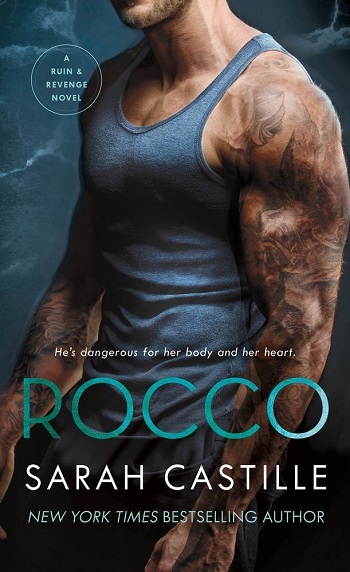 The first being that I didn’t like how soft Rocco becomes at the end, at the beginning he’s this fierce badass who doesn’t take it from anyone, and then all of a sudden, he’s a big softie who tears up when talking about one of the other guys who is hurt. It was an abrupt change in his character and very weird, other than that though, I did love both main characters. My second reason is that there are SO many characters introduced at the beginning of the story that it’s confusing and took me several chapters to sort things out, and when you add that almost everyone had nicknames, it was a lot. I think reading this book in one sitting is your best bet because otherwise, keeping the characters straight is even more difficult – luckily, it’s a fast-paced story that you won’t want to put down, so reading in one sitting isn’t a problem! Rocco and Grace have a sweet story with just the right amount of mafia roughness to make this a great read. I look forward to more from this series! 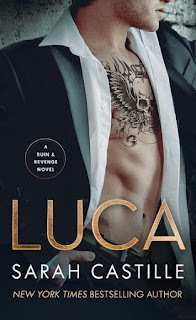 For reviews & more info, check out our Luca post. Reviewers on the Wicked Reads Review Team were provided a free copy of Rocco (Ruin & Revenge #3) by Sarah Castille to read and review.